Ever wonder what children are eating for lunch across the world? Take a look at these 11 very different school lunches and learn some fascinating insights into kids’ school lives across the globe. 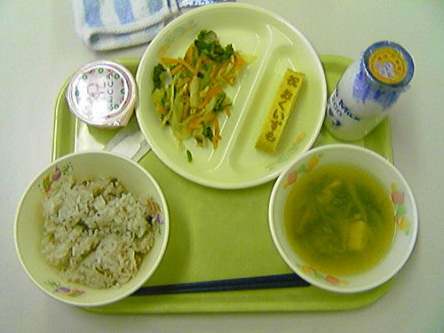 In Japan, 99% of elementary school students and 82% of junior-high students eat kyūshoku (school lunch). Burger and chips! There is a group of retired military officers stating that today’s school lunches are making the kids so fat that many are unable to meet the military’s physical fitness standards. The good news is that the Improving Nutrition for American’s Children Act was recently passed, whose aim is to make school lunches more nutritional, encourage partnerships with local farms, raise the reimbursement rate for schools and force schools to set standards for vending machine food. 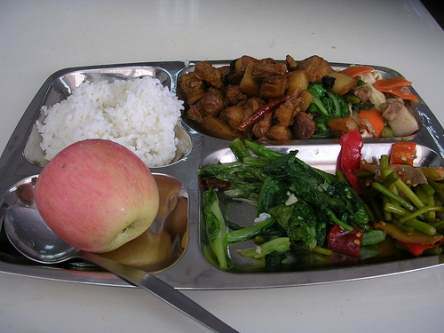 In Beijing, school lunches are typically provided by the school, who orders them through food companies supervised by the local education authority. 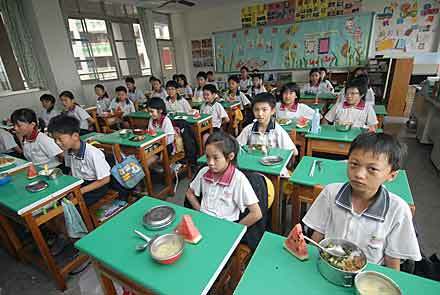 In other parts of China, children go home for lunch which provides some important family time. 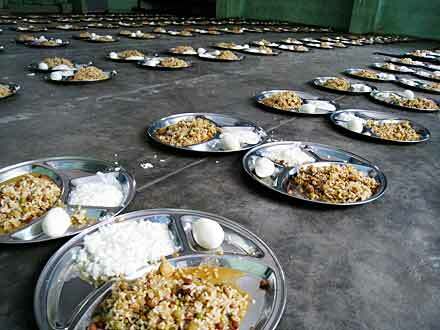 In India, school lunches are often provided from home. Ever the entrepreneurs, a food service worker called a dabbawalla has arisen to provide a service whereby they pick up the fresh meal from home and deliver it to school. The empty containers are picked up once lunch is over. 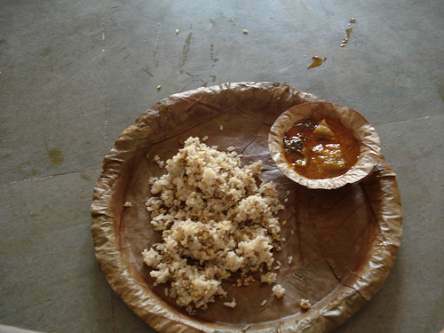 A typical lunch might be roti, (flat bread) a dal, and a vegetable or meat curry. 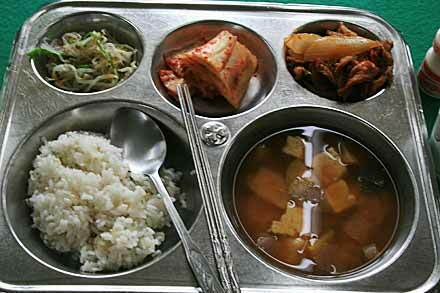 Nutrition is an important topic in South Korea, as it should be. In fact, they’ve banned junk food advertisements aimed at kids, a step that would go a long way here in North America. Pictured below is kimchi, rice, tofu, and soybean sprouts. In the UK, the debate rages on over packed lunches or school-provided meals. Jamie Oliver began a campaign in 2004 to improve the nutritional quality of UK school lunches. His work paved the way for the School Food Trust, an independent body dedicated to helping schools provide meals that meet nutritional standards. If you were lucky enough to experience British school dinners this pie and custard dessert should look familiar. School lunches in West Africa rely heavily on foreign aid. 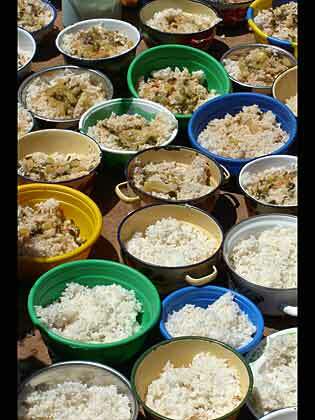 45% of the west-African country’s population live below the poverty line and 36.4% suffer from chronic malnutrition. The UN World Food Program provides meals to rural primary school children located in the arid Sahel Region — the most food-insecure area of Burkina Faso. If you’d like to get involved, a Google search yields many organizations providing help. 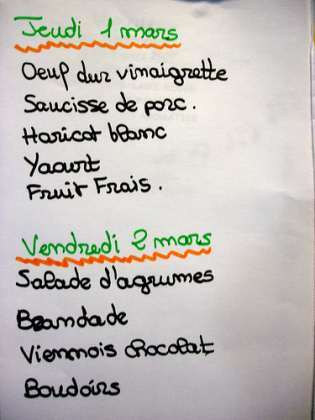 A typical school lunch in France would be considered a gourmet meal in North America. From a real lunch menu: cucumbers with garlic and fine herbs; Basque chicken thigh with herbs; red and green bell peppers and olive oil; couscous; organic yogurt; apple. Childrens’ diets in Taiwan have come under scrutiny, with reports stating that the consumption of the recommended portions of vegetables, fruits, and dairy foods is on the decline, while consumption of unhealthy snacks and fast foods is on the rise. The USDA found that students were leaving food on their tray, resulting in them receiving less than half of the recommended vegetable and fruit serving. Italy has a law that enforces schools (as well as hospitals and other pubic institutions) to use organic and local products. By 2003, 70% of Italian schools were using organic ingredients. Not only are the children eating healthier, but they are also learning how to eat healthy and sustainably. 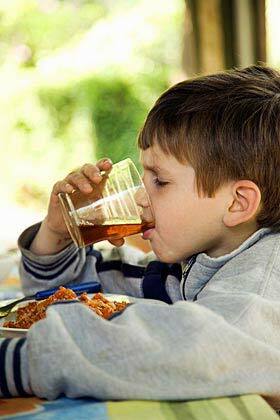 What are your kids eating at school? Teachers – what are your thoughts? Post up your comments and let us know! If you liked this you might also like: Top 10 Places to Teach English Abroad. Loved this photo essay and showing similarities/differences between countries. Having just returned from a week in Italy, I’m not surprised that the schools are required to use local and organic foods. That’s perhaps why adults demand so much in their foods! Loved this – what a spectacular idea to show people about the different cultures of the world! 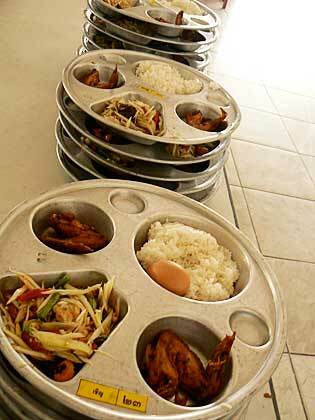 Teaching at a school in Koh Samui, Thailand, saw the canteen the first day and wanted to join the kids for lunch! 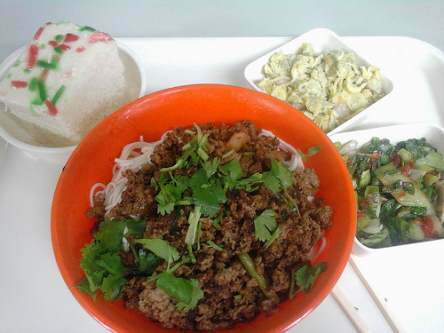 Looked great, typical Thai food. They provide the kids with plenty of milk too… (little boxes made specially for the schools and distributed) No wonder you hardly ever see a fat Thai kid. Interesting, if a bit tunnel vision-y. I’m sure school lunches vary heavily between different schools of all of these countries, as they vary between different schools in the U.S.
Wow! Really interesting to see what kids around the world are eating! Not surprised that the US is far behind on providing healthy lunches! Hopefully we can improve eventually! Aaaannd I’m now craving Thai food. Haha. I loved reading this post. By continuing to bring attention to the quality of the food we are feeding our children, I know we can change things. Even if it is just one school at a time. How interesting to see what kids are eating for lunch but i missed to see what kids in muslim countries get,like f.ex in Iran or Algeria.In Norway they don’t get food at all at school but have to bring from home…usually sandwiches with cheese and salami and ham…Or chocolate/jam. That is the Norwegian kids.Those from other countries have rice(biryani),couscous and other food from their parents homecountry. In Sweden they get food at school and very nice too. When I look at these lunches and see how healthy they are, it just makes it clearer why our elementary and high school educational system is so poor here in the US! Amazing post thanks for sharing, I think I will go have a nice Japanese Bento! 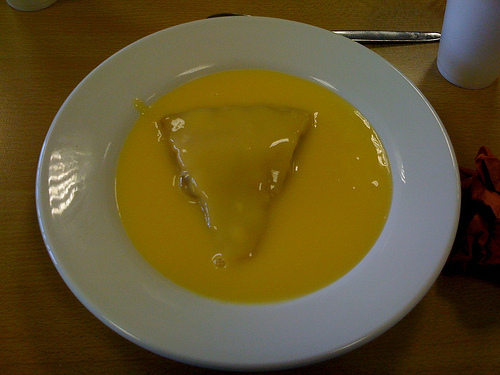 So, America has unhealthy lunches and it’s “Zomg turribble”, but when the UK does it, it’s “Oh man you guys are missing out so hard, we used to have this thing and it was awesome kill yourself because nothing will ever compare to this custard covered pie glory”? The lunch in my high school is so terrible only around 2% of the school’s population eats it, everyone else goes to the surrounding Burger King, Taco Bell, Dairy Queen, or convenience stores. It is also terribly overpriced at $2.80, for a small piece of greasy pizza (Or some other heated up, preserved, hunch of disgusting), a small milk carton (Very small), salad, and one piece of fruit. Portland Public Schools is all around terrible. I am a high school senior in the US. wow its sad just how poor we are in this category! the most disgusting food ive had has come from my school lunches, which is saying a lot for me! Just this year i have stopped eating lunch all together because of it. Your assertion that organic food is healthier than non-organic food is not supported by the evidence. I remember in High School I loved school lunch, however I also was blessed with an insane metabolism. I used to watch the other kids just get fatter and fatter, it was kind of depressing. I’m a chef now and what I wouldn’t give to have local produce and menu options as well as education like Italy does. I’ll say this much, once I have kids I will be preparing their lunches for them. I find it sad and intriguing that for a country (US) that is so obsessed with public image and social standings, we eat such junk! No wonder we have one of, if not, the highest rate of eating disorders in the world. For a country that is so advanced, we lack the common sense to realize we are killing generations with vile, repulsive things that we pass off as “food”. It’s always about the all American dollar, instead of creating and maintaining a sustainable, healthy, society with which our youth, and ourselves, can live in for many years. it’s a shame you don’t provide photos of school lunches in France, do a search and Americans will be AMAZED at how good the French eat. the school lunches in the USA are horrible we subsidize the dairy and beef industries, subsidize lunches and what do we produce totally disgusting and unhealthy food. where is the NYT article on chicken feces being used as cattle feed when you need it? or the article on the Chino, CA beef recall where sick cows were used for school lunches? 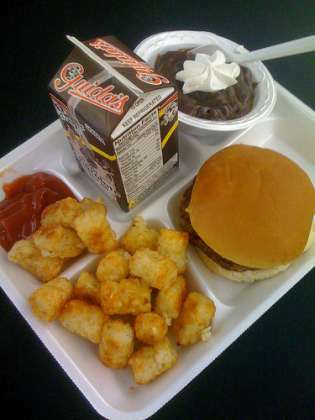 this is what American politicians feed school children. we subsidize mega-ag production at the cost of our health and food safety, and send money/ USAID to Israel a state with FREE healthcare. we make a lot of sense. 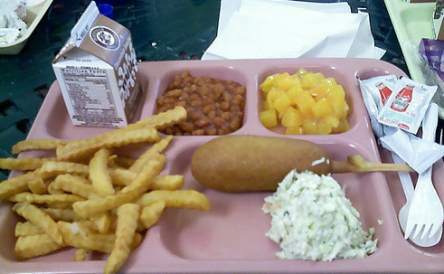 Not all school lunches are bad in America, only most of them! It depends on where you live in America. If you are a parent in America you have the right to complain and demand more nutritious foods for your children. Their health future depends on it. 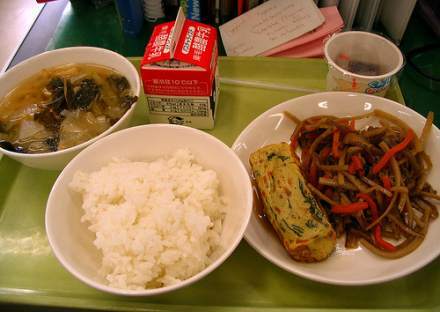 I found this look at the differences in school meals so intriguing – although the US lunch looked by far the worst with the hamburger and fried foods, the abundance of rice in the other meals over vegetables in some cases isn’t exactly ideal either. Excellent post! I also notice that all of the other schools provided their school lunches on re-usable plates; the American lunch is served on throw-away Styrofoam. Humph. I have worked in the public school setting in California for the last 15 years. The food that is served to our students is poison. It is by far the most disgusting, non-food, and processed food-look-alike product, I’ve ever seen. I wish we would/could pass the organic/local laws here. Fascinating article! In Italy, the schools MUST purchase organic foods for the children! This is so far from the staus quo in North America, it isn’t funny. In fact, it’s very sad. I’m a teacher in Canada and I am still mortified by some of the lunches that the children bring to school. White bread, deli meats, imitation cheese, brightly coloured jelly in tube format and brightly coloured drinks, soda pop, highly salted snacks and the list goes on and on. No fresh vegetables or fruit or whole grain breads! The overall cost of these packaged foods is quite high. Parents could be giving their children much more nutritious food for much less money! We need to take time from our busy schedules to take our nutrition more seriously! This article shows that other parts of the world are putting us North Americans to shame! We use our money to purchase food from stalls in school. 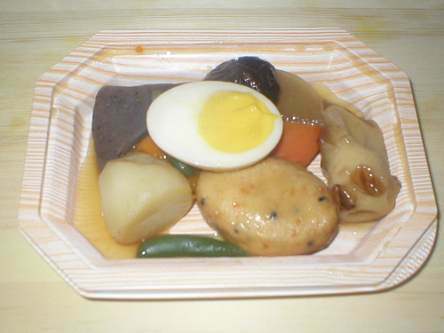 Food ranges from Malay, Indian,Japanese,Western/International to Chinese food, so on and fro. Oh Don’t Forget, Drink stalls! that sell Drinks and Fruits. @captain earlobe If I had two apples, one grown with the use of chemicals and the other without, and gave you the choice of which one you wanted to eat, which would you choose? I don’t need evidence to decide. it depends on what part of the usa you live in. when i went to third grade in phoenix arizona in 1965, the lunches were good. i remember there was always fresh fruit usually pasta and always veggies. in springfield missouri where i attended school later on in the higher grades, it was still pretty good, though this was in the late 1960′s and early ’70′s. i think it’s gotten worse since then, however, when my son went to elementary school in the 1990′s, they had yogurt and fruit options. but there was unhealthy stuff as well. Aloha, I didn’t used to eat in the cafe because I remembered what I got when I was in school. Lately I have been eating there. I was pleasently suprised! There are quite a few local Hawaiian foods which are many times a mix of all the cultures in Hawaii. Some days kalua pig and cabbage and other days chilie and rice. There is always fruit and often salad. I am impressed how much the food has improved. I have worked at many schools in Hawaii and the meals do vary depending on who is running the cafeteria. I have been to Italy and the food is just wonderful. France was not as good as Italy. Korea was pretty good, India not so good, China different. Not at all what we think of as Chinese food. Mongolia great, Tibet strange, Thailand hot, Vietnam wonderful and fresh, Nepal poor, and I could go on. I think we have to give our children healthy food that fits the culture where they live. I think America is moving in the right direction. We need less starch and more fruits and vegetables! 1 thing looks good all the rest looks nasty. That pie and custard looks like pizza in mustard. Ok, I never leave comments on sites, but I had to now. I agree that a lot of school lunches in the US are poor, some maybe not so bad. But what really bothers me is how many parents complain about public education (my child is in public schools as well), but when it comes time to vote for funding for our schools, these parents are no where in sight. Next time some one is complaining about their child’s school, I say we all ask them if they went and voted for their school district’s funding/budget. I teach in an American high school and recently the improvements are astounding. Wraps with veggies, fresh salad and vitamin waters are some of the quickest items to sell out. I recently attended lunch with my children at the elementary level and found yogurt, milk, turkey with gravy (not great for you, but much better than greasy chips and fries). Programs all over the nation are popping up where sponsered groups garden and then school cafeteria uses the produce in salads and condiments. I think we are making progress….maybe. Wouldn’t it be a nice ‘Homage” for our school children in the U.S. to have traditional school lunches from around the world? What a movement of goodwill ambassadorship that would be!!! I have worked for the past two weeks as a “new Lunch Lady” in an east coast elementary school. As a grandmother, I am appalled at the food we are serving our kids. Most of it is processed food with little or no nutrition to speak of. It disgusts me that mac & cheese from a can is considered protein. Other meal choices are tacos, meatball sandwiches, Beef-a-roni, Chicken nuggets, popcorn chicken and every friday is some style of pizza. In my day at the same school, we recieved ham & green beans, hot Chicken sandwiches or waffles, Chicken pot pie, Grilled cheese w/ tomato soup, Chili with butter bread, vegetable soup w/ham sandwich and either fruit , jello, cake or pie for dessert. Ice cream was rare. There were no vending machines. We ate well back then and I’d bet these meals were healthier as they were made daily. How did we get here? I think the U.S. needs to revamp their school lunches. No wonder there is so much obesity in children here. I think right from the start we should teach our children what to do to stay healthy, and that includes eating. I’m not saying you can’t occasionally eat “junk food”, but on a daily basis is definitely not a good thing. no wonder kids in u.s do so badly in school.